It is obvious that there are some dead generalizations posted on our word cloud about the South. What suspicious things have you all heard about the North and/or Massachusetts? ‘Twas part of the Louisiana purchase. They named Louisiana after the French King, Louis. That is why there are French named town like Baton Rouge and New Orleans. But that doesn’t really make the south French, no one would even know about it if they hadn’t learned it in history class. I can understand why you called us rude. Us “Northerners” have not been taught manners in school unless our parents taught us. I know that in the south you’re taught manners in school but for most people here, it’s just a general understanding. Although we don’t say “yes ma’am” or “no sir,” we say our pleases and thank you’s. I think the question is what is considered polite? I’m sure you guys aren’t mean, but like you said we are taught manners in and out of school. That’s just a much bigger expectation of us, so I guess it seems weird that that isn’t a part of your life. My favorite smoothies are strawberry blonde and that is about it and college football is awesome here. It’s the same with us. It’s weird to think that you guys were raised so differently, but I guess it’s only weird because I’ve never encountered someone like you guys before. It’s good to know about other people so we can understand them better and expand our knowledge of other places, even if they’re in our own country. I feel a little bit embarrassed about this because i know a lot of these stereotypes aren’t true. Trust me, a lot of the stereotypes are true. I’m from D.C. and after moving to Tennessee, I found out most stereotypes are true. There are tons of gun-nuts, republicans, and rednecks. Most stereotypes are false I know so many people that have never shot a gun but have lived in the south their entire life. And not everyone is a republican some are independent or democrat but everyone is respected to their own choices in politics. I agree with that fact Max. What people don’t get about this comment is that I meant what I said, in a sense. Some people are like this, it doesn’t mean all of us are. Sorry if this was offensive. Actually, most of these stereotypes are not true, so you obviously have no experience with the south. First of all there are not that many rednecks, living in the south my whole life I have met more normal people than I have rednecks. While some of the things they said were true, most were not. When I said they were true, I meant them in a sense. There are rednecks inmate south, but it doesn’t make all of us rednecks. I’m sorry if this offended you. I think a lot of the stereotypes made are focused on the bad side of society that isn’t true for most people. I guess we just said rednecks because we don’t have any rednecks near where we live. But don’t get me wrong, I completely understand that not everyone in the south is a redneck. I was interested by how many of you talked about things in the city when many of historical and important places are in small towns or are small towns. Also Canada is in the north but this is about the north of the U.S. So I was reading your Wordle and I was wondering is the words “uptight” and “jerk” and “rude” really necessary, and if so just wondering why and what facts do you have that makes that true. Trust me. If you ever met us, even for a second, you would know that we are the least uptight people in the universe. I didn’t say any of that. Being from the North, I know that there are just as many rude people in the south as there are in the north. I apologize for my classmates. I don’t think you should be picking sides. We are just trying to find out what it is actually like down in the south and what it is like in the north. The things that we said are things that we have learned from the south’s past and when we visited the south for vacations. Just like how the things you have said about the north are from your own experiences of the north. This isn’t like we are fighting we shouldn’t be picking sides like a war. I don’t think Elizabeth meant exactly “sides” I feel like she was meaning more like are you saying you don’t agree with what words we came up with, because all of our classes made up these words as a whole. I think that a lot of people from the south believe we seem rude because of our tone or maybe because we use different abbreviations in talking to friends or texting etc. If so couldn’t we say that you guys are rude since your speak differently to each other? After all we do speak differently it is almost like in the north we speak a variation of english and the south another variation. Its like Australia and the UK. I think that people from the south assume that because y’all don’t say yes ma’am and no ma’am and yes sir and no sir and stuff like that because it is considered rude down south to not address your elders like that. I’m going to be honest; I’ve been wanting to say what Nils said for a long time. I’m sorry, but it just seems like people being rude in the north is a big implication on how we live when some of you haven’t even truly met a person from the north. Plus, I’ve read some things from you guys down in the south that I consider rude, like what TJ just said. I’m really sorry that this happened, but I guess we can understand better how similar we are, even in our rudeness, because I have heard people talk like that here. Cooper, my respect for you just doubled. Very well said. Cooper is right. I have lived in the North and the south for years. Racism and Slavery are things that are so unforgivable I am not surprised that people will connect the south with slavery. Just last night I was watching TV and their was a part of the show called redneck rocket scientists that were both rednecks and worked at nasa. I am so so so sorry (insert doctor who joke) for the people who said rude, mean and of all things inferior. I did not take any part in that and I am sorry. The thing is though it’s 2014 and the world has chnaged every where you go in the world north or south you might see some racism. We can easily forgive you for that. It’s just a stereotype, and everyone wishes they could erase what they’ve said, which is proof enough that you’re sorry. I’ve lived here for most of my life, I just don’t consider myself a southerner. Sorry if this offended you. I only meant that there are rednecks republicans etc. in the south more than there are in NYC. Sorry that I offended you, and everyone else. That’s about exactly what we meant. Am I the only one who feels like Cooper is the best one on this subject since he’s lived in the north and the south? I’m not on anyone’s side. Like Austin said, there are no sides, we are here to learn. And by the way, you shouldn’t be offended. I was simply saying that SOME southerners are like that, not all. To say that would be preposterous. I’m sorry if this offended you. I’m curios why you said “side”? We just want to learn about the south and how you view us. Do you think that the idea of Red Necks comes for our modern day entertainment, or something else? Quick question, are there really two sides? We’re one country and we’re in this together. Yes a lot of them are not true. You know what not all of us are racist. Most of these are inncorrect or false. Kind of like the watermelon and fried chicken. I understand that not all of the southerners are racist but is just a generalization that part of the south is racist just like how part of the north is rude. It isn’t like every one is racist like how not every one is rude. I would say that our generation is not racist. Sure, our grandparents or great grandparents might be because of how they were raised (I am not saying that that is a good excuse for being bad to people. I’m just saying that that is the reason.) I would say a very small portion of the south is still openly racist, but there are also Northerners who are racist. That does not really show a geographical relation in the newer generations. We are taught the same thing as you: that it is bad to be racist. It is bad to be racist but there will always be racism in society. As a grade we put down racist as a word because of your history and what your past has done. I and I think that lots of my grade also understands that not everyone is openly racist but in society the bad things are always highlighted. Those people who are racist may be a minority but they have an effect on our opinion of the south just like how you view the north as rude because people in New York may bump into each other and get mad at each other. Only a minority may be rude or racist but that is highlighted in community. Well said. I completely understand why you all would put that. It is a large part of our history. I like fried chicken and watermelon and I have always lived in the north! I think its more of a personal opinion than a geographical choice. I agree. I’m sure a lot of our words about the North aren’t true either we all don’t have a very good ideas about the North and South besides the information that we have heard. You’re wrong and right. There are rude people wherever you go. Listen, I was saying that SOME people are like this. Not all. You shouldn’t be so easily offended. At BGA and in Williamson County in general, you don’t see many rednecks and some of the other stereotypes listed above. I didn’t mean what I said in a negative way. I was simply stating that there are stereotypical southern people out there. Once again, I apoligize. Once again, I never said that all of you guys are rednecks. I said that there are rednecks. You need to understand what I’m saying and not jump to conclusions. If you have a problem with something I’ve said, please talk to me about what I said and why I said it before you decide what I really meant. And I would also like to say I’ve lived in the south for almost 10 years now, I’ve just never considered myself a southerner because I wasn’t born here. I’m sorry. Cooper, you ruined it. Why’d you apologize? You were right, and while everyone else was being all offended, you were actually thinking. You shouldn’t apologize for something like that. In life, you have to stand your ground with your opinion. If you’re easily pushed over like that, your thoughts will just be disregarded because you apologized, making the other person feel correct and superior. Everyone else, get over it. Both schools said stuff they didn’t want the other to hear, but getting offended about it is not the point of the exercise. Yes both schools said stuff that they didn’t want the other to hear, so we should figure out why they said that. I feel a little bad about these comments because they are very stereotypical, but this is what is introduce to us if we aren’t from the south. I agree I think that all of us put down the most common thought ones and thought about it all in the moment and didn’t think about how offensive people would take it. Well we should probably change that. because thats embarassing. A good majority of what you and your class said is true. Some, however, are outdated and completely false. For example, “slavery,” and “segregation,” definitely don’t apply to the south. Are you sure about that last part? Okay, anon, where have you seen segregation in the south nowadays? Do you have proof? I have never in my almost 14 years of living in the south, seen an instance of segregation or slavery nowadays. I think you’re confused. I agree. I think that some of these words are spot-on, but on the other hand some are completely off. The weirdest word is death. That really freaks me out. Honestly, ours are just as bad. We didn’t know anyone would see it and don’t actually think anything bad about you as people. We based ours off of stereotypes which I’m sure aren’t true. I agree also! That’s the same with us! I think that all of the words here are dated to different time in history, and that us as a class don’t know what the south is like now in the twenty first century. We also don’t know about what a southerner is like( at least I don’t know), and I would like to learn more through this activity. It is interesting what other people view us as. I used to live in New England and I had similar views of southerners before moving down to TN. I’m pretty much a northerner (living in Tennessee, born in Florida, which despite being a state in the southern U.S, is not apart of what is generally called ‘The South’, because it was owned by the Spanish Empire and did not become a state until 1845) and I can say that asides from the slavery (which obviously no longer exists in the United States) , lots of these can be associated with the South in one way or another. Racism is still very present amongst the previous generations (I.e, elderly, middle aged parents) though not so much in in the area of Tennessee that I’m in. Cody, in case you didn’t know, Florida is south of TN. Cody, isn’t Florida the southern most state in the US? How would that make you a northerner? Nate, I think MW was referring to just the continental US in this discussion. I’m saying I’m ‘pretty much a northerner’ from a political standpoint, because Southern Florida is not Deep South and it primarily goes Democrat and has similar ‘ideals’ if that would be the correct terminology. Only northern Florida is considered Deep South. If I were to be geographically correct Florida is indeed southern. Actually I lived for a long period of time in Georgia. Living in Tennessee now, I see the south has come a long way. But down there ya’ll was the universal second person plural pronoun. Fried chicken was our Sunday dinner. The sweet tea flowed like water and almost every t shirt was cut at the shoulders. Everyone ate venison they shot themselves. It was a den of rednecks. Tennessee isn’t like that though. Bennett there are plenty of places like that in TN just not the part you have been to. One more question. Which of these words describes Southerners or the South the least? KFC and Florida. I think KFC explains itself, and Florida simply isn’t a southern state. It may be southern geographically, but it isn’t southern politically or socially. I would say the idea about a ton of farmers isn’t true. Not everything is country. Sure some people do have farms but not everyone. Also, not everyone is racist. I am very diverse, as well as my friends. I think racism is for sure a thing of the past that gets so held against the south. The names of the food places because I traveled around out west and I’ve noticed that they are all over the United States. I would say death is… How does the south remind you of DEATH??! Hi Advent Episcopal School, I just saw this word cloud and I’d be interested in what your reactions are. Something I’m really excited to discover is how you picture us and what our stereotypes are. I’m really looking forward to getting to know you and I think we can learn a lot from communicating with one another. Well when I first read it I noticed slavery was the biggest which isn’t true and hasn’t been for like 100 years, some people were out raged with racism saying it’s not true but sadly it still holds strong with a lot of southerners and it’s so sad. I also found it funny that y’all said Cowboys which I associate with the old Wild West not the south. What was your reacting to our word cloud about y’all? My feeling toward this image above is a deep apology that my class and I owe you. What you see up in the picture are a number of stereotypes that are most likely incorrect. I’m sure this got us out on the wrong foot, but I hope you can forgive me for the things up in the word cloud. My deepest regrets, Bryn. You are right, Sone of the stereotypes such as that we are Hillbillies and that we all drink whisky are incorrect but there are many that are actually accurate. Most of what people learn of the south is the Civil War and slavery and it is expected that it will be mentioned. Many of these things that we said seem to be stereotypes. Many of us as a group have know idea what the south is really like. The biggest thing in the word cloud “slavery” is no longer actually happening in the south. I think that it will be very interesting to see what you guys think of us. I agree. It’s no longer happening, yet it’s what we are remembered by. I find that interesting. Most of the these are stereotypical or incorrect. I understand that most of you don’t really know what the South is like, and we don’t know much about the North but slavery and many others are quiet offensive. Charlie, all stereotypes are based somewhat in fact. Many stereotypes are tree, but in moderation. There are rednecks or people like that, but they aren’t as many as you’d think. Moving from D.C. I can see how you would think these things, and I’m not bothered by this as much as some of my more “southern” classmates are. I’m a little embarrassed about what we said because we were just taking stereo types to list things and/or having fun with it or being funny so for that I’m sorry if you were offended. I agree that many of these are stereotypes, but I think it’s cool that we can see what the North’s opinions are of us. I agree with Christina. It’s cool to see what other people think about the South. I grew up in the North, and when I moved down here I found it very interesting. To be completely honest, everyone in my class who is getting offended needs to get over it. We both had no idea that the other would see why we said, and even then, I don’t think either of us were that offensive. We were honest, and that’s the important part. The point of this is to see what we thought of each other. By getting irritated at each other, we are being arrogant and pigheaded. Most of these things that we think of the south. Most of these are stereo-types, like rednecks, fried chicken, hillbillies, y’all, and black. We just don’t know what it is like in the south except the civil war and slavery. Most of these might be mean or upsetting you but, we just don’t know. This isnt what we are like now, so its upsetting that this is what we are known as. i think all of us should learn more about the north and souths character. Hey, I’m a bit embarassed by the word cloud. Our class didn’t think that those words would be shared with you and even bigger the whole world. I hope to see what you guys think of us. We didn’t expect ours to be shared either. Ours has some things that i’m embarrassed of too. When you see ours I think that this scenario will repeat. It’s ok I feel bad about are word map. I believe many of these words, are stereotypes about the south. I wasn’t sure what your class meant by death, so if you could further explain. Some of these words that are true to certain people are KFC and crispy-creme. I’m a little bit embarrassed by the word cloud above. Most of the words said above are really just stereotypes. I bet we all have stereotypes about each other. I’m also very interested to see what the schools south of us have to say. A lot of the things my classmates and I wrote in the word cloud are based on movies we’ve seen, or things we’ve read. Almost all of the words in the cloud are based on stereotypes. I hope that we can learn more about what the south is REALLY about through this project. I think all we really know are stereotypes. We don’t really know what’s true and false but it will be interesting to find out. Most of these stereotypes are true. A few, as in “Slavery” and “Segregation,” are outdated but fried-chicken, rednecks, saying the word “y’all,” BBQ, and many others are indeed in fact true for most parts of the south. Most of the words in this word bubble are stereotypes that we have seen in movies, TV shows, and books. We know that there are a lot of things that aren’t true, so we are sorry about that. I hope that you can tell us how the south really is. Well some of these are true but they are all stereotypes none the less. Are there any accurate assumptions that are posted above? There are some but a lot of these are not true. Mostly not. Some are racist and some are not. Some of them are correct like the redneck one. most of the assumptions are pretty stereotypical. mostly, we arent racist and its kind of offensive that everyone thinks so low of us. the cloud is really more based on far in the past. some of them are correct, like texas and georgia, and food. Although “slavery” and “segregation” are outdated and not true, many of the other words can be true in one way or another, but it depends more on the specific person or place you are you are talking about. The accuracy of these words really depend on where you are in the South. While some may be true for one person or place others may not. Words such as “warm”, “accents”, “football”, “fried chicken”, “y’all”, “BBQ”, “hospitality”, and “hunting” all can describe Franklin, TN. Some are and some aren’t. I think you and your class overdid it with most of the words. There are some, but we’re not all cowboys. Most of them are inaccurate, many of them are quite racist and some just make no sense to me like “death”? I am really sorry for the offending words in the wordle, we really didn’t know these words were going to go up on the blog for everyone to see. I noticed that a lot of people have been asking about death. I really don’t know why someone wrote that, but I think they were trying to be funny and that just said it, but I don’t agree with it and I can see why you were offended. I believe the more we communicate, the more we can understand about what it’s really like where other people live. On the other hand, some of the words used to describe us are very rascist. I am feeling really bad about seeing all those stereotypes that my class and I wrote. Some of the words in bold are terrible stereotypes that we were thinking when Mr. Lenci told us to write 5 words that come into mind about the South. I hope you guys can forgive us we are not that mean. It’s all good Sarah because we said some rude, stereotypical things too. The words rednecks and hillbillies is a little too much though. I don’t find the words offensive because I can tell that you have had no experience in the South. I’m sure that some of the words we thought of for the North are also just as offensive for you. No need to worry about your words being stereotypical. I think all of us are going to have several words that we may have heard as kids or that we have seen on tv. I do have one question though. Why do you think of death when told to talk about the south? Don’t worry. That’s exactly what we did, so no hard feelings. Don’t worry ! Some of the things we said our very judgemental and stereotypical. As soon as we found out that these were being shared with y’all we felt extremely bad. Sorry!!! The reason we said slavery is mainly because we were just talking about the civil war and this is in history class so we assumed that we were going to be talking about slavery. Hi, Advent Episcopal School, I would like to know how you first felt when you saw our stereotypes towards the South and what you think of us Northerners. When I first saw this, I honestly laughed. I laughed because yes some of this is true, but the fact that you listed off fried chicken places is a little rude. Also, watermelon is in the North too. I think of Northerns are a little rude. Not all Northerns are rude and mean, again that’s just another stereotypical opinion.We most defiantly have some stereotypical things in our wordle too. Well I thought it was rude and offensive. The south is our home and it’s not exactly nice to know people think so low of us. I don’t think that we are rude because we associate the south with fried chicken. It doesn’t make us think lower of you. Fried chicken is just another stereotype that isn’t true. I eat hot chicken (fried spicy chicken) at LEAST once every two weeks, and the line is always out the door and around the corner of the hot chicken place, so….I think the fried chicken comment is pretty accurate. People here love fried chicken. They even made a special once on Food Network about the best hole-in-the-wall fried chicken places in the South. It was kind of awesome (and delicious). Nobody in the north thinks low of the south. There are a lot of stereotypes that aren’t true, like the fact that we don’t live in apartments, and that you don’t always eat fried chicken. We live so far apart, that we haven’t truly gotten justification that those stereotypes aren’t true. I’m sorry if that offended you, but it’s nice to know that it isn’t true. My class and I wrote a lot of things down that we thought of as stereotypes and things in movies; we know that in the south there is no longer slavery. Hopefully, over time using this website, my class and I can deepen our understanding for what the South is really like. The south in my home. When you live here you get use to the southern ways of life. Like farming. There is no need to apologize, We said mean stuff too. It is true some of us do have accents, I say ya’ll quite a lot. I feel that this Wordle, that my class made, is very stereotypical and written with things that are most likely not true. Although, with some certainty you will have other stereotypes for us, I would like to apologize for some of the words written above. Yes, some of these are incorrect and are stereotypes. I don’t think any less of y’all because of the lack of knowledge you have towards the south. This seems very stereotypical. It is somewhat embarrassing to me because I was one of the many who thought to of slavery and segregation when they thought of the south. I know that it is definitely not true currently, however, when thinking of the south I usually think of the civil war and the amount of slavery the south had. I apologize for this. We understand, we did not know our wordle would be posted either. Even though most of the things you said are wrong, we said some poor choices too. The fact is we don’t know much about each other and we will learn more, our views will change. I agree with the fried chicken and y’all ,but I do think that some of them are not true. I don’t understand what the death comment means, and maybe in the past the south was thought of as racist, but I would say that, that is very inaccurate now. I could see how you would put racist according to your studies of the Civil War and the South’s slavery, but now we are not segregated and not racist. We have learned our lesson from 150 years ago and have definitely changed our ways. I feel that a lot of these words are very stereotypical or false. For an example there is also watermelon in the north, but I think it’s very sad that one of the big things the South is known for is slavery. Probably because the Civil War was fought primarily in the South. I agree with this wordle. You are so incredibly false I know so many people that have never shot a gun but have lived in the south their entire life. And not everyone is a republican some are independent or democrat but everyone is respected to their own choices in politics. I am not really offended by anything to much because they weren’t that bad, but there are something’s I have to ask. First of all, why did you put death and smoothies? Also, I understand racism but I want to know why you put four varieties of the word. Like, racism, racist, inequality, and segregation. It just seems a bit much. By the way, sorry about the wordle, we didn’t know that y’all were gonna see. Hey, I put smoothies because when I have gone to Florida I drink many smoothies. Sorry for the confusion. True. My grandparents live there, and they told me that a lot of people from Boston and such. First of all, sorry about our wordle too. And second of all, I have literally no idea who said death. I have no belief that this is true in any way, shape, or form. I know our wordle for the North seems to be a little stereotypical, but it is what popped into our heads at the first thought. Your wordle is pretty stereotypical, too, but I guess we were influenced to think these things from stuff we were told. Sorry about the wordle. We are going to have to deal with the stereotypes though, so let’s get over it. 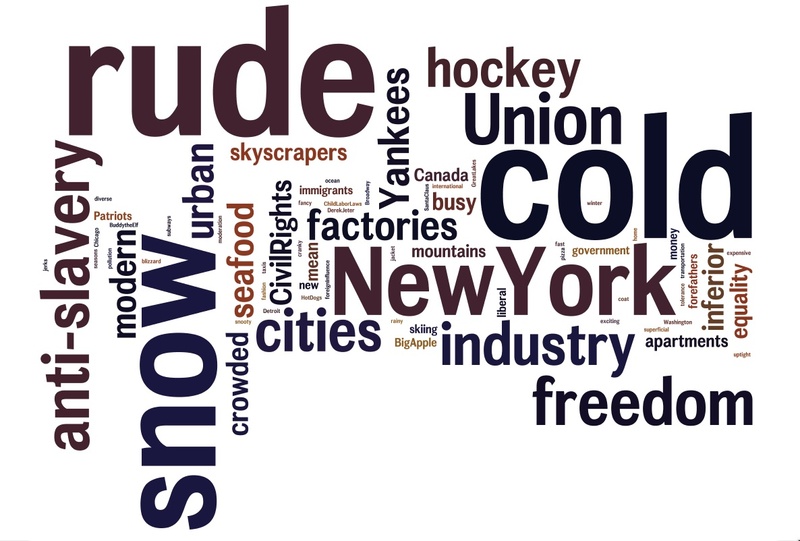 For our Wordle about the North, I think that it is definitely very stereotypical. Many things are probably not true, like rude and uptight. Just like you all’s Wordle many of are words are based off of movies, books, and tv shows. Unless, we have travelled or have relatives that are from these areas, we would never truly know what each section of the country is like. Based on the South’s history, I could see how many of you would put racist or segregation but with our current state, I would disagree that any of us are racist. I am quite embarrassed and disappointed by seeing our wordle as I can tell that many are untrue and VERY stereotypical. As some of my classmates wrote rude and inferior, which I deeply apologize for. But I feel that many words in this could be true, we’re we at all correct or were we way off? If that is how some of your classmates feel, so be it. There isn’t really any need to apologize because I think we all said somethings that may have made some others a little hurt, surprised, or confused. I think because of that all of us must leave what is in the past in the past and start looking forward to the big Defoe court case at hand. I’m kinda sad that you guys think of us as that. Most of what you said isn’t true. I was a little hurt when you guys said that we are rude and snooty and jerks. Although you might have some stereotypes about us, that doesn’t mean we are jerks. I did like how you guys were talking about the Yankees because we live in Massachusetts (close to Boston), so most of us actually hate the Yankees because they are the Boston Red Sox’s rival!!!!!! I also thought some of the things you guys said about the North were really funny, especially when they were about food. On the wordile about “Northerners” one of the words was inferior, and I was curious why you felt this way. it was just southern pride, we didn’t know this would be posted. We just love where we live and come from that’s all! We get that, but it’s rude and hurtful to say that a group of people are inferior to the other. And based on your response, it seems you still think so, which hurts. I find it interesting that the wordle says rude. I think this interesting because I have never heard that stereotype before. I would like to know why you guys said rude. Your wordle had words like jerks and rude. What do you mean by this? Do you mean all of us are jerks and rude and why? Just would like some extra clarification on that. Thank you. We have no way of knowing what the north is really like, and we have never even met any of yall. When we said jerks and rude those words were based on stereotypes because that is all we have to think of yall as. We do not think all of you are jerks or rude. I’m very sorry for anything else that my classmates and I may have said that could have offended yall because we had no idea this was going to be posted. I feel it is a little unjustified that you called us jerks (next to anti-slavery), but I do see that once I look at what we wrote I can see that we have a lot of stereo types in our writing as well, like fried chicken, cowboys, and shotguns. I think it was weird that you guys said anti-slavery because the country its self is anti-slavery. Also we’re not rude…how did you think of that. I don’t really care about what anyone said but I think that it’s just weird that you said things that really made no sense. I would love to hear if there is anything you think I said was wrong. I read that you said that we were uptight, what makes you think that? Why does it seem that most of the comments are about us being jerks, mean or expensive? Just because we live up north, doesn’t mean that we are all those things. How do you think that you feel this strongly about that? I am originally from Texas, and when I moved here I did not notice any major difference between Texas and Massachusetts (especially these comments). A lot of the comments posted about us are true, we have many cities and right now it’s about 6 degrees. I love hockey and we are quite crowded in these cities. A lot of your stereotypes but I don’t understand why that makes us jerks and snooty? I myself was raised where I must use my manners at all times as most Southerns are so I guess whenever we don’t hear others saying “yes ma’am” or “yes sir” and all of that we just see it as coming off rude or disrespectful. Why is there a lot of stuff on Christmas like Santa Clause and Buddy the Elf. There are a lot of different holidays that are celebrated, not just Christmas. Well… I see where you are coming from with the snow and relation to Santa and Elfs. Well in the south, there is no snow. So we thought of the North as a wonderful place with snow. I am just wondering why you think that we are rude, snooty, jerks. I mean, some of us are, but aren’t there people like that everywhere? That is a pretty big stereotype, and we have some pretty big stereotypes about you that I apologize for. I think everyone that wrote down the word rude in are cloud was basing it off of their opinions and thoughts about northerners that they had recently talked to or had been in a situation with. I agree. I think people put it because we didn’t know it would be posted for everyone to see. How come you think that we are uptight and jerks? What proof do you have of this? Aren’t there people like that every where, we were all majorly offended by some of the things that you said. We are did not intend to upset anyone. We were just sharing what information we had on the north which being someone who has never lived in the north is slim to none. So our perceptive and opinion is based on movies, rumors and books. So of the things that you were confusing like jerk and rude. What do you mean by this? Well, you’re right. Up here we aren’t expected to say “yes sir” or “yes ma’am” but that doesn’t make us jerks. We say please and thank you, we hold doors for people, and we help people when they need help, even if it doesn’t look like it. Heck, a friend group I have kind of insults one another, but that’s just how we’re friends with each other, and we know that. We don’t do that type of thing with everyone, just us, and it’s fun. And when we address our teachers, we always say “Ms.”, “Mrs.”, and “Mr.” followed by their last name to dignify respect. I think it is a little unjustified that you called us jerks (next to anti-slavery), but now that see it I notice a lot of stereotypes on both sides. That’s very true both sides have false beliefs about each other. That’s probably because some people have never lived in the north (like me),so we have no idea what it is really like. I don’t know why your hating on cooper, he’s just sharing his opinion. If anything he’s doing the thing he should, so STOP. If you don’t agree just talk not yell at him. Some of the people are just offended by his words and standing up for themselves. Most people have lived here all their lifes. People have the right in this country to share their opinion with each other. So I’m not exactly sure why you are all ganging up on Cooper for sharing his opinion. A lot of the comments posted about us are true, we have many cities and right now it’s about 6 degrees. I love hockey and we are quite crowded in these cities. A lot of your stereotypes but I don’t understand why that makes us jerks and snooty????? It doesn’t but that the stereotypes we hear portray Northers as rude and snooty. I looked at the wordle, and saw the word “Canada” in there. I know that the word north is generalized, but this was referring to north in the aspect of the USA. I’m curious as to why you said canada, so why? I think someone decided to throw the word Canada in there because they thought it “resembled the north” and was close to the north. I think it was mostly intended as a joke, since some of the Northern states are practically Canada. I was just wondering what lead you to say rude in your wordle I know that ours is based off of movies, books and other people but I was wondering where your stereotypes came from? Ours are also based off movies, and also past experiences. Well it’s just hard to compete being in between Canada and the south, where we value manners and hospitality very highly. I’m sure you’re not all rude. We got the stereotypes from movies, TV, books, and other people just like you. Well I have some personal experience i was getting on the subway in New York and got knocked over, and almost got left in the station, I also realize this doesn’t describe y’all but things like that just stick with people. Do any of y’all have a experience like this with the south if so I would love to know. Yeah half my family lives in the South, (Atlanta and Alabama) and I also go to camp in Alabama. So I have a lot of experience in the south. One time I was at a shooting range and there was a guy that saw my patriots hat, and he told me to go back to the north, called me a yankee, and then wasn’t letting me get through to where my family was sitting. I don’t think that he was intending to be rude, but like you said things like this just stick with people. I think that you’ll meet a lot of rude people in your life but most of the time they’re from all over the place not just one part. That’s what I think! I didn’t know how much people think of New York when they think of the North. I saw Buddy the Elf, Yankees, and Derek Jeter, which are all related to New York. I find that interesting. Also, I have never really heard of us up North being jerks or rude. We are raised with saying “yes ma’am and no sir.” We are not trying to offend you. It is just what we were taught as a kid. Exactly. And we were taught to address people by what they wanted us to call them. The north and the south are pretty far apart, so it makes sense that these misconceptions happen. We’re all about as mean as one another, which isn’t saying that we’re all mean, just saying that we all have times where we’re mean to one another, and times when we’re nice to one another. I also have never associated us Northerners as rude, but I can see how BGA students could associate us with rudeness because we all have different perceptions of rudeness and what it means to be rude. For you it may be saying “yes sir” but for us we have different ways of showing respect to our peers. I was wondering why you wrote in your word cloud that were rude. I know it is a stereotype that you would think off, but do you really think we are all rude? No. I am talking about my experiences in the past when i went the north. I am not talking directly about you or your friends, but there are many people that are rude. Where did you visit, and what did people do that suggested they were rude? In the south we appreciate manners and hospitality. When we meet someone has different views on these subjects, sometimes it comes off as rude or disrespectful, even though that is not the intention. So when people are raised and brought up with diverse customs, I guess its just first instinct to think that those customs are wrong, compared to our own. I’ve noticed that some of the smaller words on the wordle that you made about us show that you think that we’re stuck up, wealthy, and rude. Some of us are rude, and stuck up and wealthy but don’t use those stereotypes to identify all of us. When I think of the North, I think cold, rude, freedom, and updated. I’m curious why you said rude. Most of are just raised differently than you are and we aren’t expected to say “yes ma’am” and stuff like that. I saw palm trees on your wordle, and I’m a little curious on why that up there. Florida is technically part of the south, but so many people from the north go to retire in florida, so it kind of isn’t, but geographically it still is. I noticed that the word “death” was in your wordle for us. And I was just wondering what you mean by that. I am very upset about being called a hillbilly. It makes me very sad.. Even though we live in southern areas, doesn’t mean we live on farms and are wearing straw hats. Many cities in the south are fast growing in population. Why would you guys say this? Do we come off as “hillbillies”? Hi there–Ms. Sefcik from BGA here. I’m hearing a lot of discussion in the classroom right now about how cultural expectations have played a big role in why we perceive each other as potentially rude. Some of my students have been talking about how, when they went “up north” for vacations/Christmas, they encountered a lot of younger people who didn’t say “yes, ma’am” or “no, sir” when speaking to adults. They couldn’t understand how those kids could be so (as they thought) rude, and were quite shocked when I told them that I had never said a “ma’am” or “sir” in my life until I was out of college and had already been living in the South for four years. I grew up on Lake Erie in Ohio, and no one I ever knew said “ma’am” or “sir”, but that didn’t mean everyone was rude. The expectation for what manners were was different. I will say that the expectation here, in TN, is that all young people who are polite follow every answer given to an adult with a “ma’am” or “sir.” I’ve gotten used to it, but it’s also been 10 years. I think that as we move forward with this project, it will be very interesting to explore the cultural differences we have, and I am very grateful that all of you from Brookwood and from BGA have so far been honest and open with your comments while trying to understand our inherent biases. I know all of my students here are so excited to work on this, and we’re looking forward to hearing more from all of you! What kind of music do y’all listen to? A lot of us like country music actually but we’re mostly into pop. A lot of our words in that cloud were stereotypes; we know you aren’t all rude. And I’m not sure how snooty or inferior got up there at all. Really sorry for those. I don’t usually use the word ya’ll. I have always lived in the south but I love the Sox. Respond with Roll Tide if you’re a fan ya’ll. I say y’all all of the time. I feel bad about some of the things that were said, such as Rude, or Snooty. These adjectives may apply to some individuals, but it shouldn’t be an overall view of such a large group of people. We’re almost all red sox fans, and we’re enemies with the Yankies. I would like to apologize for my classmates’ rudeness when they saw what you guys put. Although it is quite funny how rude they were being considering that lots of them put rude for the north, even though they were the rude ones in this instance. As for the word cloud you made for us, it was somewhat accurate. Except for the outdated stuff, of course. I would like to say that the reason I put rude was because it is a stereotype about New York and when you think of the north, you think New York. I also would like to apologize for saying some of the things said, I have met some nice and great people in Massachusetts and New York. Btw Fried Chicken is the bomb and don’t feel too bad about putting slavery. We put that in our wordle for us too. None of us knew these would be shared. Honestly all lot of the stereotype y’all said are true but not entirely, there are plenty of rednecks but also a lot of people that aren’t. I’m also sorry about saying rude and stuff like that but I had a bad experience in New York, got nocked over getting on a subway but I also realize that New York isn’t the entire north. Lastly I would like to say the north is very beautiful. I would like to know which of the words in the word cloud accurately represent the North. I honestly believe that many of these things that we used towards each other were definitely just pure generalizations of what we believe the “others” are. Yes, some of these words can indeed be true, many things, such as the rude or cranky, are absolutely false. I would like to apologize for any hurtful things I might have described the North is. what we have grown up hearing and I have only visited the north once and most of the people were very sweet but maybe not what I have known as polite. I was also wondering like many of my classmates what yall meant when yall said death for the south. I was also wondering why y’all put french on their, is it because of Louisiana or what, also I was wondering if any of y’all have had sweet tea. How does death relate to the south? Some of my classmates were goofing off in class so I apologize if that offended you. I think that on of my classmates was just doing that to be funny… I am very sorry. Thats a very good question I don’t even know how that went up there. Why do you guys refer to us in the north as jerks and rude? I just think its a little different in different areas of the nation and one more question. Why call us inferior? Why is there jerk there and rude, is this how we are in your eyes? Why call us inferior? I just think that some people can be mean if they are not from there. Im from Ohio and there it is completely different there than here in the north, before I moved I used to think the same as you until I got to know people here they are just as good as any one Ive ever met, in ohio or anywhere. Also, if I may add, we’re not sorry for what we said. Honestly, those are stereotypes that you in the south have; rednecks and hillbillies. We’re not saying they’re true, we’re just saying those are unfortunate stereotypes, you have just like we’re considered rude. I have been to the south many a time given that my mother was born in Virginia and my father was born in Kentucky. It’s really about the way we are raised up here in the north. I imagine we would be raised very differently if we were in the south. You guys were correct in saying snow. In fact, we got snow just yesterday. At the moment it is 5ºF. Does it ever get cold in the south? Have you ever seen snow? What temperature do you consider “cold”? It snows some but for it to be substantial amounts and for it to stick is rare. Cold to me is around 35 but at the moment here it’s 29 and the wind chill is 19. How warm dose it get up there. As I was looking at the Wordle, it perplexed me that you said inferior. Do you think that one of us is better or worse? Personally, I think that we are just different than each other, not that one side of the Mason-Dixon line is “Better”. I’m just curious to know why you thought of the North as inferior? Inferior would never be in my list of words to describe the north. I can think of a few people in my class who would put something like that trying to be funny, but I doubt anyone actually thinks one is better than the other. So, I know that one reason that you guys think we’re rude is that we don’t say “sir” or “ma’am,” but are there any other reasons why you think we’re rude? I’d appreciate to know what you guys really think of us. I’ve had some experience. I was in New York and got knocked over trying to get on the subway and almost got left. I know this probably dosn’t describe y’all but that just sticks with me. The guy probably didn’t know he knocked you over, or he was being pushed by the crowd. There are some rude people in the world, but one thing i’ve learned is that you can’t judge an enormous group of people based off of one person’s actions. Most of the things that were rude in the cloud were said out of honest opinions. By honest opinions do you mean experiences? Or just it was sort of all thrown together? For those who are wondering about the true Northern things on the wordile they’re patriots, hockey, snow, cold weather and seafood. I’m sorry if we offended you in anyway with our wordle. Some people are rude in the north, and some people are rude in the south. I believe that’s said about our society as a whole. Do y’all agree with the word busy? Not really. It is busy in New York and bigger cities, but not in the suburbs or really most other places. Why did yall put fried chicken on there? Hi BGA kids! What does the confederate flag mean to you? I’d really appreciate some input from more informed individuals on the subject.